Dave Sena brings tremendous knowledge in nonprofit leadership and fundraising to nonprofit executives and staffs through his company, Bold Leading. Experience? Check. Know-how? Absolutely. Dedication to clients. Without a doubt. Homepage content that set the stage for all of those messages? Well, that needed just a little extra oomph. 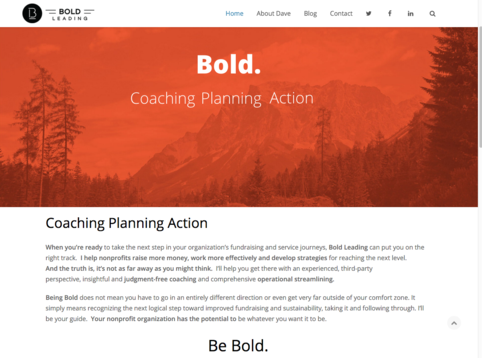 I worked with Dave to craft messaging that serves a foundation for talking about issues nonprofits face and how Bold Leading can help them work through and beyond them. Be Bold, is the message, because your next level probably isn’t as far away as you might think. Since that first project with Dave, which also included copywriting for an email drip campaign, I’ve helped him meet several of his clients’ messaging and content needs such as content for appeal letters and newsletters.